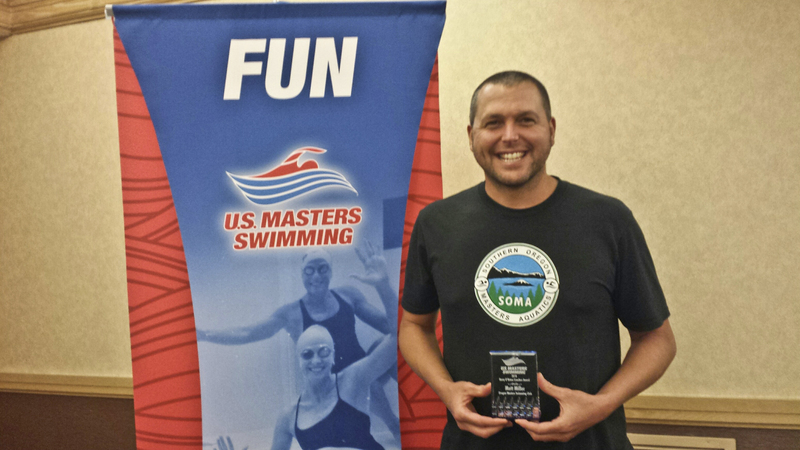 The U.S. Masters Swimming Coaches Committee initiated a new award in 2008 with the goal of recognizing USMS coaches who are building our membership in communities throughout our country. Originally named the Grassroots Coaching Award, it has been renamed to honor Coach Kerry O’Brien of Walnut Creek Masters, who embodies the passion, dedication, and heart that these coaches bring to the pool deck. It is with the efforts of individuals like these that U.S. Masters Swimming will most certainly move to a greater level. Matt has been an enthusiastic Oregon Masters swimmer for some years now, but in the past four years he has made a huge contribution in the area of coaching. While he unofficially coached a group of southern Oregon swimmers by writing workouts, encouraging swimmers to set goals, and helping them achieve those goals, he went beyond this in the Fall of 2017 and formed a local workout group, Southern Oregon Masters Aquatics. He recruited members (now up to 42), created a team logo, ordered swag for team members, and generally created much enthusiasm in his swimmers. He brought 28 SOMA swimmers to Oregon’s Association Championships in April, 2018, with about half of them having never swum in a prior meet. Matt creates workouts that challenge swimmers of all abilities, including the ‘I want to go the distance’ swimmer, triathletes, novice swimmers, and competitive swimmers. He is skilled in stroke technique and in communicating that information to swimmers. His workouts are creative, interesting, and challenging, and he brings an enthusiasm that is motivating to swimmers of all abilities. Matt has also become a guiding hand for one of our 95 year old swimmers for whom he enters meets on line, figures out splits he needs to apply for records, enters him in Nationals, makes airline reservations, and rooms with him. Matt does this with a smile and compassion to assist someone, and thoroughly enjoys the experience. Two years ago Matt assumed the co-chair position of the OMS Coaches Committee and has worked to offer and staff stroke clinics in various parts of the state for Masters Swimmers. He is always willing to offer stroke advice to any swimmer. He has served as the Oregon Club’s coach at Nationals four times, and has done a superlative job in this position. Matt is an avid open water swimmer, has served as an event director and took on researching, purchasing, and testing a chip system for Oregon Masters events to assure their success. Being an Information technology expert, Matt assisted OMS with getting to the ‘cloud’. He stepped up to host the OMS website and worked with our webmaster in developing the revamped OMS website. He eventually assumed the position of Webmaster and currently serves in that position. He assisted with organizing Oregon’s bid to host the 2016 Summer Nationals and revamped how OMS delivers information to our swimmers. He also assists with video presentations at Oregon Masters Association Champs social/award presentations. He attended the U.S. Aquatics Sports convention in 2017, is now serving on the U.S. Masters Swimming Long Distance Committee, and attended convention in 2018 as well. Matt is available, responds timely, is an active Board of Directors participant, and is always willing to take on a new responsibility. From one of Matt’s SOMA swimmers — Matt personifies a well-rounded person with many skills and demonstrates many attributes with ease, to all who have the good fortune to come into contact with him, i.e. he’s friendly, sociable, thoughtful, and helpful. He’s also a very motivated hard worker, no matter the task. He takes on responsibilities with dedication. In the swimming world, this translates to a very passionate pro-active person, whether he is providing coaching, organizing swim meets, forming a new team, managing websites, or promoting swimming in a myriad of different ways. Matt is always upbeat and excited about anything and anyone related to swimming! Matt has consistently demonstrated these skills and with a certain humility. It is always a pleasure to encounter Matt, whether it be pool-side on-deck or in the water. He goes out of his way to be helpful to everyone. Matt is a model Masters coach — knowledgeable, fun, enthusiastic, creative, motivating, and reliable. This Award is presented annually to USMS registered individuals whose volunteer service has contributed to the growth, improvement, or success of U.S. Masters Swimming locally, regionally, and/or nationally. Dot’ Donnelly was a member of USMS at its inception. She tirelessly served as coach, meet director, and ambassador for our organization, and served as our elected Secretary, maintaining the national office from her home for many years. Individuals are selected based on their accomplishments that meet the USMS goals and objectives. Christina has served on the Oregon Masters Board of Directors in the capacity of Membership Services chair for nine years. In this role she contacts workout group and club representatives, updates information for the website, and responds to questions from newly forming teams. She has worked to increase the LMSC membership by making sure USMS marketing materials are sent to anyone inquiring about Masters swimming as well as providing the Oregon workout groups and club representatives with these materials to assist with promoting Masters swimming at local pools. She is an ambassador at her local pool where she approaches swimmers about the benefits of Masters swimming and recruits these swimmers into USMS members. During open water swim events at which Oregon Masters allows one-event registrations, Christina is also proactive in trying to recruit one-event swimmers into full USMS membership. Christina contributes regularly to Board discussions and assists with meet evaluations and actively brings up issues regarding both competitive and fitness swimmers as to how we as a leadership team can better recruit and serve our membership. Christina has also served as meet director for some of Oregon’s largest championship meets and volunteered at the Solutions table for the entire 2016 Oregon Summer Nationals. She has more recently become active at the national level attending conventions, and is currently serving; she is a contributing member on the USMS Rules Committee. Christina competes regularly at the local and national level and is a most thoughtful and encouraging teammate. She is quick to offer a kind word and knows most of the swimmers at our local meets. Others who also compete look forward to seeing her at meets, and she has regularly won or placed in our local most splashes competition that honors those who attend meets and swim the most events. 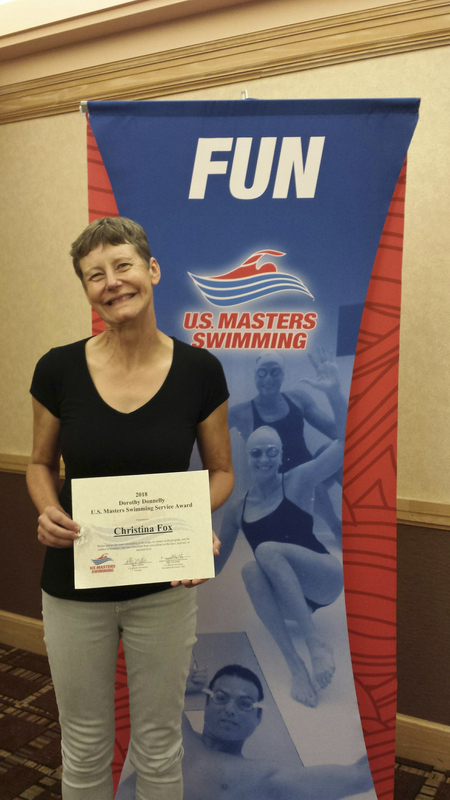 Christina has demonstrated a long term commitment to Oregon Masters Swimming and is excited about her contributions to U.S. Masters Swimming. She has contributed much to USMS. Wow!!! Way to go Matt and Christina! Hi Matt & Christina!! OH!! SO deserving!!!! Congratulations to both of you, you both rock, & keep the rest of us paddling!! Thank you for the many years of support & role modeling.